In my mind, breakfast is the most important meal of the day. It doesn’t have to be a big production, but it’s essential that it happens. We go through phases at my house, but common breakfasts include egg sandwiches, smoothies, and oatmeal with fresh fruit. All delicious, all easy, all prepared by me since my darling husband doesn’t cook. (His line: “Why should I learn when you’re so good at it?” 🙂 I suppose this is why I haven’t “learned” to haul the trash to the curb on Tuesday mornings.) Anyway, I’m happy to help him get a good start to the day during the first part of the week when his office opens a bit later, but Thursday and Friday mornings are killer. 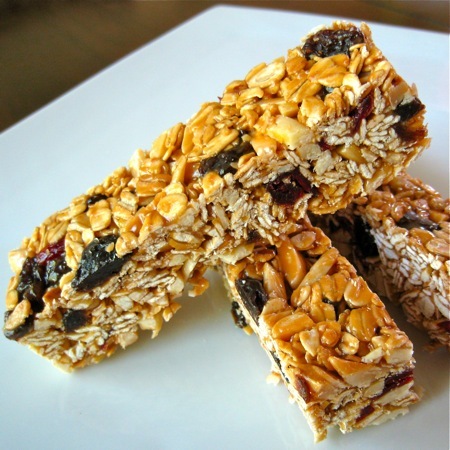 In trying to come up with a grab-and-go solution that was more substantial than a banana or a cup of yogurt, I found a great recipe: Emeril’s Nutty Granola Bars. They’re soft, chewy, delicious, and filling, and the recipe is infinitely adaptable depending on what you have in the pantry. Preheat oven to 325 degrees. In a small saucepan, heat 1/4 cup honey and butter over low. Cook, stirring, until butter melts, 2 minutes. 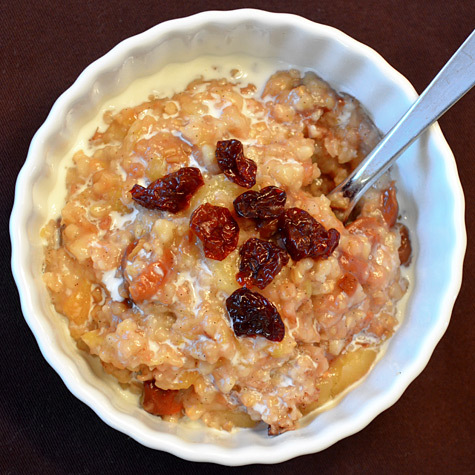 In a large bowl, combine oats, almonds, and pinch of salt. Drizzle honey mixture over oat mixture and stir to combine; wipe saucepan clean. Spread mixture evenly on a large rimmed baking sheet. Bake until golden brown, about 20 minutes, stirring occasionally. Let cool completely on sheet, 10 minutes. Return to large bowl and add raisins; stir to combine. Lightly butter an 8-inch square baking dish. In saucepan, combine 1/2 cup honey, almond butter, and brown sugar over medium. Cook, stirring occasionally, until mixture comes to a boil and sugar dissolves, 10 minutes. Drizzle over oat mixture and stir until combined; transfer to baking dish. 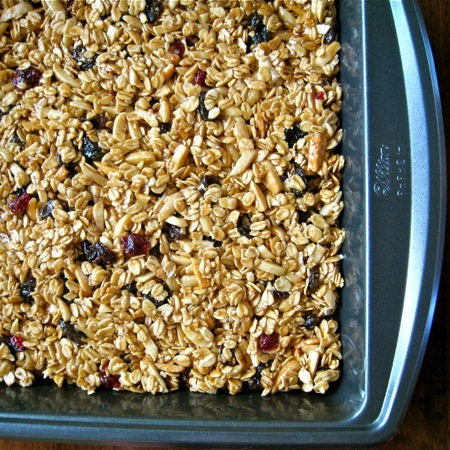 With a spatula, firmly press granola into dish. Refrigerate until firm, about 1 hour, then cut into 16 bars or squares. Holy deliciousness, these are good. The taste is very similar to the soft packaged granola bars you can buy at the store, but I think they hold their shape better because they aren’t as gooey. Plus, you get to skip all the preservatives that keep the store-bought ones edible for months; these will keep in an airtight container at room temperature for five days (unless they’re gobbled up sooner!). I ended up using creamy peanut butter, slivered almonds, and a combination of raisins, dried cherries, and dried cranberries for my bars. The flavor profile was terrific. I can’t wait to experiment with other combinations like cashew and cherry or maybe macadamia nut with coconut and dried apricots. The possibilities are endless! Update 7/29/11: I made these again last night, and they were terrible. I re-made them this morning, and they were wonderful. The difference? I cooked the honey/almond butter/brown sugar mixture for too long last night. If you’ve ever made candy before, you know the longer you cook sugar and the hotter it gets, the thicker and firmer it gets when it cools. For some reason, I thought it would be a good idea to cook the mixture for 10 minutes once it began to boil. I knew something was wrong when I added the cooked mixture to the oats and fruit; it didn’t incorporate very well and some of the oats still seemed dry even after I had stirred and stirred. When I went to cut the bars after I had chilled them, they were crispy (in a hard-to-eat way, not a good way). This morning, I cooked the honey/almond butter/brown sugar mixture for 10 minutes total, starting with the moment I turned on the burner. You could even shave a minute or two off if you want your bars to be super soft; just make sure the sugar is fully dissolved and you have a homogenous mixture. Live and learn! 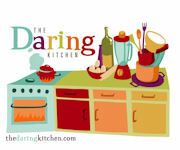 The 2010 December Daring Bakers’ challenge was hosted by Penny of Sweet Sadie’s Baking. 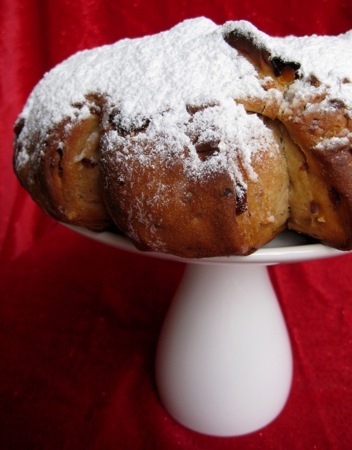 She chose to challenge Daring Bakers to make stollen. She adapted a friend’s family recipe and combined it with information from friends, techniques from Peter Reinhart’s book………and Martha Stewart’s demonstration. I briefly contemplated skipping this challenge because of Christmas chaos, and I just barely managed to bake off my stollen loaves before my husband and I hopped on an airplane home, but I am so glad I participated this month. 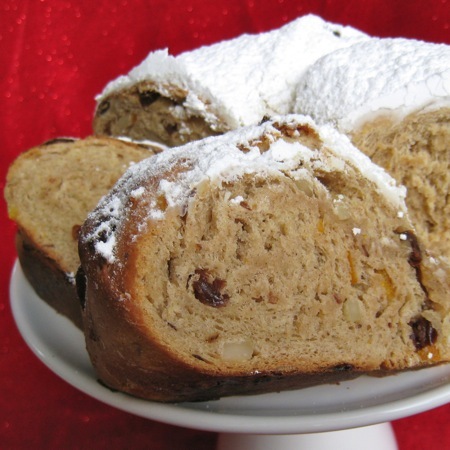 My husband enjoys my day-to-day cooking and he definitely lets me know, but he has never heaped praise on me the way he did with this stollen. He loves it. I stashed the majority of the loaf I cut for the photos below in my carry-on bag and hauled it back to Nebraska; my family loved it as well. I guess my dad tried to go to a European bakery to buy some Czech Christmas bread on the 23rd or 24th and they were completely cleaned out at 10 a.m.; this bread was similar and satisfying enough to save the day. After reading Audax’s posts in the forums, I used bread flour instead of all-purpose flour. I used orange extract when we had the choice between orange and lemon. I did not use any maraschino cherries because I didn’t want to risk turning my bread pink. I used slivered almonds instead of sliced almonds because that’s what I had in my pantry. From there, I followed the recipe exactly as written except that I formed my dough into two wreaths instead of one. I saw how large the wreaths were in the forum posts and figured that my tiny 24-inch oven wouldn’t be able to handle one. I baked each half-recipe wreath for 36 minutes, rotating the baking sheet from front to back halfway through. The major upside of baking two wreaths? We came home to one waiting for us in the refrigerator. This bread was so tasty! It wasn’t like fruitcake at all. The bread texture reminded me a lot of cinnamon rolls; it was moist and chewy, though the crust was pleasantly crisp. The powdered sugar and butter coating was heavenly. My bread had a distinct orange flavor since I used orange extract and all candied orange peel (instead of candied mixed peel), and I would make it this way again next time. I could have gone for a bit more fruit and nuts in the bread, but I appreciated that it wasn’t totally packed. My family enjoyed this recipe so much that I’ll be adding it to our permanent Christmas collection. Thanks for a new family tradition and a great challenge, Penny! Forgive me for another update and another breakfast post. I’ve been entertaining so much for the past two months that I’ve been returning to my “tried and true” recipes… It seems I learn something new each time, though. 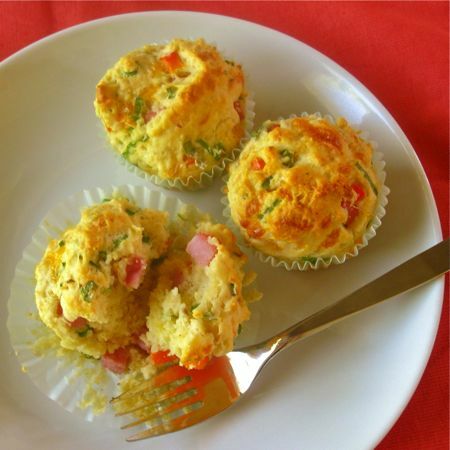 Today’s recipe – Ham and Cheese Buttermilk Breakfast Muffins – is one I first tried back in October of 2008. It’s written for sea level but works beautifully at high altitude, probably because the muffins are made with buttermilk. 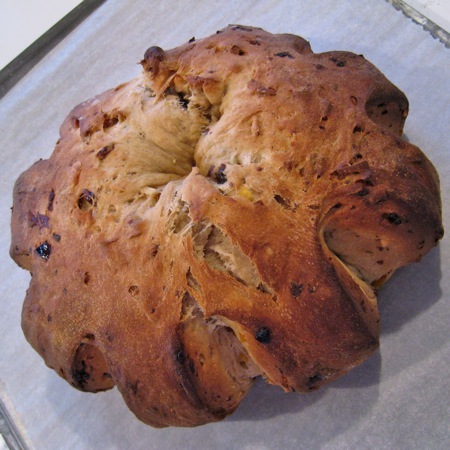 (I’ve had a lot of success here in Denver with baked goods that incorporate buttermilk; buttermilk’s high acidity helps batters set more quickly, which can eliminate the “flat tire” phenomenon that occurs so often with high-altitude baking.) Anyway, they were a big hit the first time around because they’re easy, delicious, and a great make-ahead option for company. Back in 2008, I placed the batter directly in a greased muffin pan and had just enough for 12 muffins. This time, I decided to try paper liners. I couldn’t fit as much batter into the paper liners as I could with the bare muffin cups; each muffin was a scant 1/4 cup instead of a heaping 1/4 cup, so the baking time was reduced from 28 minutes to 22 minutes. Since the smaller muffins resulted in leftover batter, I decided to make some mini muffins as well. Each one was made up of 2 tablespoons of batter (one scoop using my cookie scoop) and the muffins baked for 15 minutes. 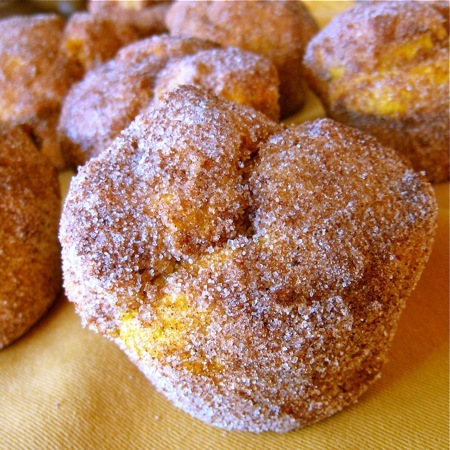 In a large bowl, whisk together the flour, baking powder, baking soda, pepper, salt, and cayenne pepper. In a medium bowl, whisk together the eggs, buttermilk, oil, and butter. Stir in the scallions, ham, cheese, and bell pepper. Add the wet ingredients to the dry and use a rubber spatula to mix until just moistened. Scoop the batter into the prepared pan (heaping 1/4 cup each for unlined 12-cup muffin pan, scant 1/4 cup each for lined 12-cup muffin pan, 2 tablespoons each for mini muffin pan). Bake the muffins until the tops are browned (at high altitude, about 28 minutes for unlined 12-cup muffin pan, 22 minutes for lined 12-cup muffin pan, 15 minutes for mini muffin pan). Let the muffins cool in the pan for 15 minutes then loosen the edges with a knife (if necessary) and transfer the muffins to a cooling rack. Serve warm. To store, individually wrap the muffins in plastic and refrigerate for up to 3 days or freeze for up to a month. To reheat, remove the plastic wrap, cover the muffin in a paper towel, and microwave on high for 30 to 60 seconds (15 – 20 seconds for mini muffins). I was recently hit with a major influx of bread. My dad was in town last week and my uncle was joining us for dinner at the house, so I had purchased a package of white bakery buns for barbecued chicken sandwiches. An hour before dinner, I got a fantastic Foodbuzz-related delivery: three packages of rolls – one white, one wheat, one sesame hoagie – courtesy of Nature’s Pride. My uncle voted for the wheat rolls that evening and I ended up freezing the white and sesame rolls, but my original package of white buns was left sitting in the pantry. For the past couple of months, I’ve been making a concerted effort to keep my groceries bills down and to de-clutter my pantry by using what I have. What’s one of the best ways to use up extra bread? 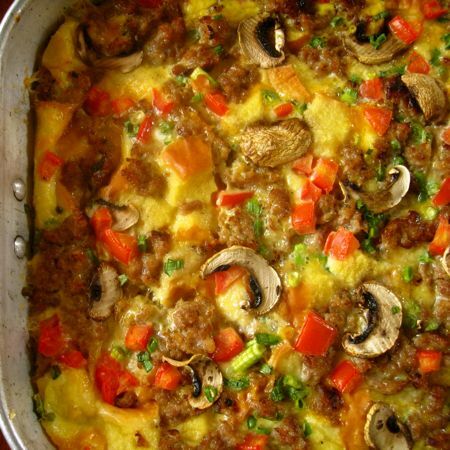 Egg casserole, baby. My mom has a recipe that has been a longstanding family favorite, but I hadn’t tried it since Dallas. With so many houseguests coming in the next several weeks, I figured it was time to add this one to my high-altitude arsenal. I followed the recipe exactly as written except that I used some of the Mexican-blend cheese I’ve had in the freezer since the Ocho de Mayo party. (If anyone wants to come over for quesadillas, let me know. I still have four pounds of it!) I also used all of the optional ingredients. I baked the casserole for the full 60 minutes and let it stand for 10 minutes before cutting into it. If you’re looking for a creamy, cheesy, comforting crowd pleaser, this is your recipe. Give it a try! Are you interested in a trip to food heaven? 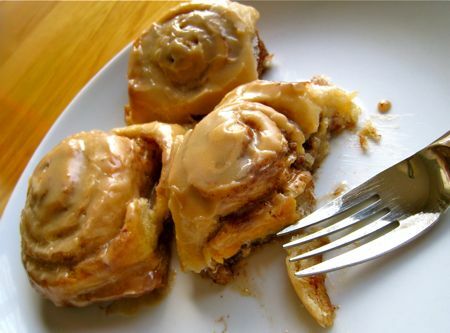 Pioneer Woman’s Cinnamon Rolls can take you there. Between dough making, rising, rolling, filling, cutting, rising again, and baking, the rolls require some effort. I think they were delicious enough to be worth it, though, and even a half recipe will leave you with plenty of rolls to store or share. After I scalded the milk, oil, and sugar, I let it drop to around 120°F before I proceeded with the dough making. (This took about 45 minutes.) I used an instant-read thermometer to measure the temperature. After I added the first quantity of flour, my dough seemed a bit loose and I was worried. Everything worked out fine with the rising and rolling. I refrigerated my dough overnight before using it. I just punched it down before I rolled it the next morning. Rolling the dough (both into a rectangle and into a roll) was a bit challenging. Hopefully, I’ll improve with practice! I used butter-flavored cooking spray to coat my baking pans instead of butter. My rolls didn’t rise much during the 20 – 30 minute pre-baking rise period, but it didn’t seem to matter. I used those 8 1/2-inch round aluminum foil cake pans that you can buy at the grocery store. I was afraid they would be too shallow (they’re about 1 1/2 inches high), but I didn’t have any trouble. I think the ideal number of rolls per pan is 7 or 8. I did as few as 6 in one pan and as many as 9. The more space you give them, the more they expand. I baked two pans right away and froze one (tightly wrapped in foil). I let the frozen one thaw on the counter for an hour and then factored in 20 minutes of rise time before baking. I baked each pan of rolls (fresh and previously frozen) for 17 minutes at 375°F. A half-recipe of icing makes approximately 1 3/4 cups. Divide it among your pans accordingly. When I say the rolls are sweet, I mean sweet. I’m a bit of a sugar addict and I definitely enjoyed them, but they may be too sweet for some. 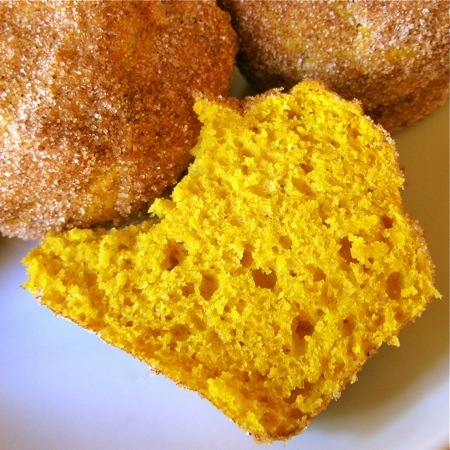 I think you could successfully cut the amount of sugar in the rolls in half; I was shocked when I had sprinkled the entire surface of the dough with sugar and still had half of it left in the measuring cup. 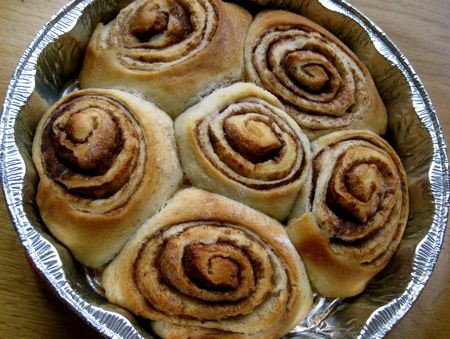 I think the rolls are best when they’re warm, but they really were delicious the entire day they were baked. (I know because I couldn’t stop nibbling on them.) They did start to take on a “day-old pastry” taste the next day.